As with many dishes I’m preparing for the first time, obtaining a workable recipe is often the first hurdle to cross. Unfortunately for Klang Bak Kut Teh, there is none. Despite being an immensely popular dish, it seems almost ironic that very few seem to have gotten down to cook it themselves! Put off by the prolonged boiling required perhaps, or the facade that it would be difficult or laborious. Or maybe garnering the Chinese herbs and spices required poses as an immediate challenge. Swee San, a Klang local helped by showing me the ingredient list on the sachet packaging of a supposed very good version of Klang Bak Kut Teh, which was also tried, tested and wholeheartedly recommended by Wendy. So that helped to form the basis of the herb and spice concoction to be used for the soup base. Seven ingredients were listed on the packaging. I went on to add another three to the list making up to a grand total of ten, based on some research from other foodie blogs who had tried the various versions from numerous reputable Bak Kut Teh Stalls in Klang like 成发 Seng Huat, 凤娇Fung Keow etc. Sounds like 十全大补汤 I know but it is not! Then comes the question of authenticity. Lucky for me, authenticity and originality is never a problem with Klang Bak Kut Teh. There are so many stalls and shops selling them in Klang, each different from the other and all boasting to be using their own “secret family recipe”. Variations and nuances in the herb and spice mixture is only to be expected. The number of different types of ingredients used is also nothing short of being spectacular. From the usual pork ribs, many stores have also developed other “flavours” through the use pig trotters, pork belly, chicken and even seafood! 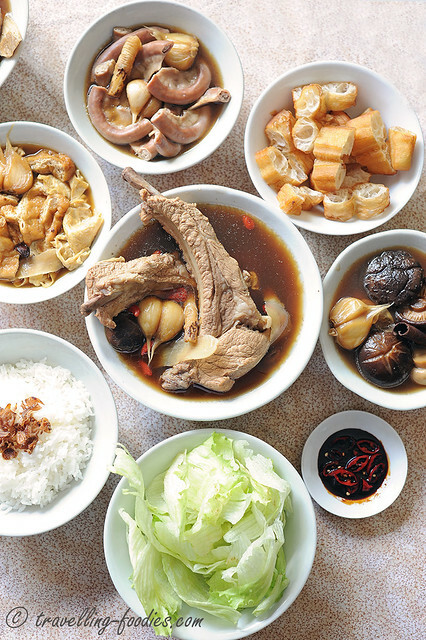 An assortment of vegetables can also be seen in different Bak Kut Teh joints, from the standard chinese mushrooms, to iceberg lettuce, button mushrooms, enoki mushrooms and even cauliflower! From the original version served in bowls, the claypot version seemed to have become increasingly popular. Yet, some still stand by tradition and continue to serve them in bowls. In short, the possibilities are endless! 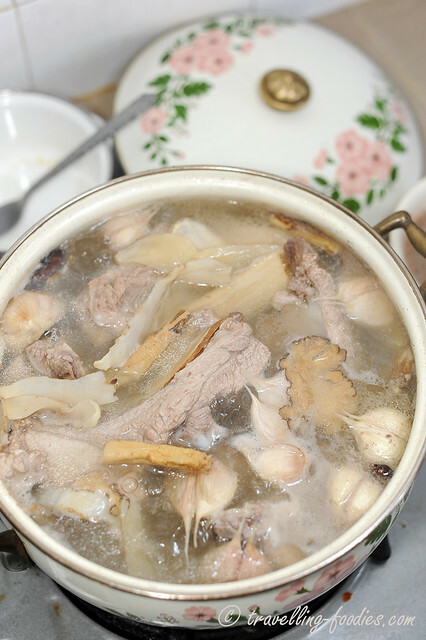 The arsenal needed for Klang Bak Kut Teh mostly known for its herbal broth base. 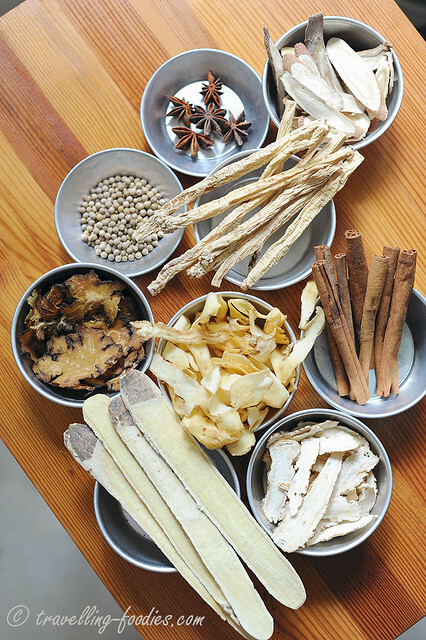 From top to bottom, left to right, they include star anise, Chinese licorice, white pepper, dang shen, chuan xiong, yu zhu, cassia bark (chinese cinnamon) , bei qi and dang gui. Wolfberries are added later when the dish is near its finishing. A visual gauge of the amount and types of herbs used for a pot for 4-6 persons. The star of the show, pork ribs. I’d used 1.2 kg of the much coveted prime ribs Normal spare ribs as well as other parts as well as chicken can also be used. 700g of big bones were also added for the broth to improve on the flavour and of course collagen but this is optional. I’d also added “sweet intestines” which is essentially the first portion of the small intestines called the duodenum. Quite commonly found alongside pork ribs in Klang Bak Kut Teh, not to mention a personal favorite. 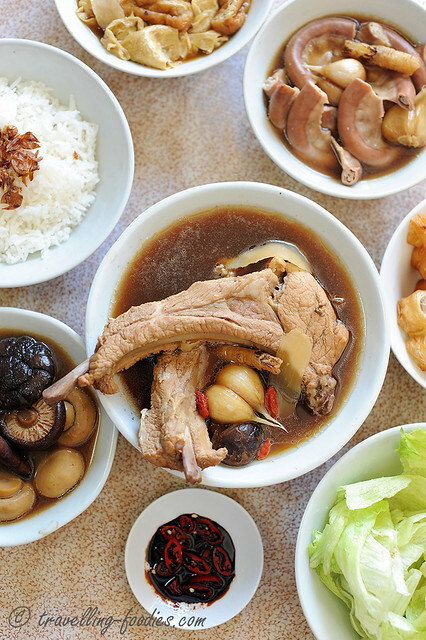 The choice of garlic in Bak Kut Teh is also important. 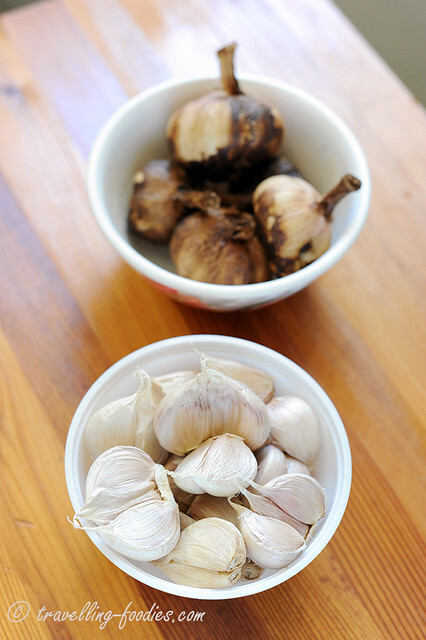 I’d used old garlic which has a strong aroma and flavour. They are commonly sold in Singapore under that name or simply as Bak Kut Teh garlic. Smoked garlic can also be used. Garlic turns so mushy and sweet after prolonged cooking they are almost good to eat on their own! 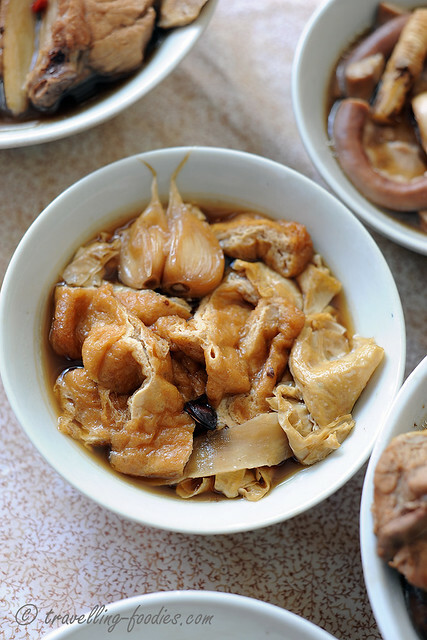 In fact, these little morsels of creamy goodness is often what true blue foodies go for in a pot of Bak Kut Teh. The initial concoction, about 20 mins into cooking. Ingredients are added in progression to maximise their potential in flavour and aroma without the risk of overcooking them. A muslin bag can be used to hold all the herbs and spieces in place but I prefer to have them “all over the place” and added them directly into the soup as what most folks in Klang do. Yet another 20 min later. Sweet intestines, chinese mushrooms, button mushrooms are then added. Tau pok and tau kee are cooked separately. 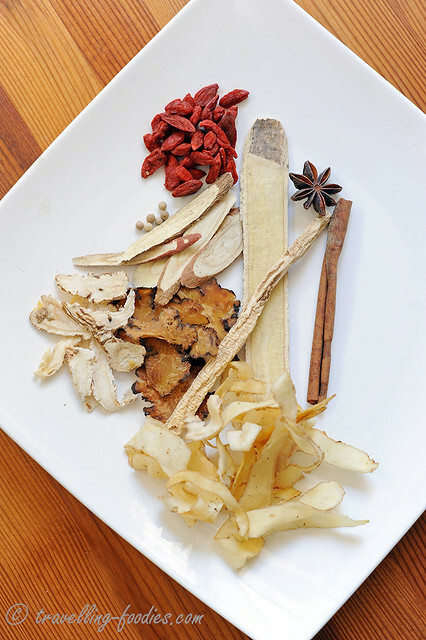 This is to prevent the oil used for the processing these ingredients from affecting the pot of Bak Kut Teh. 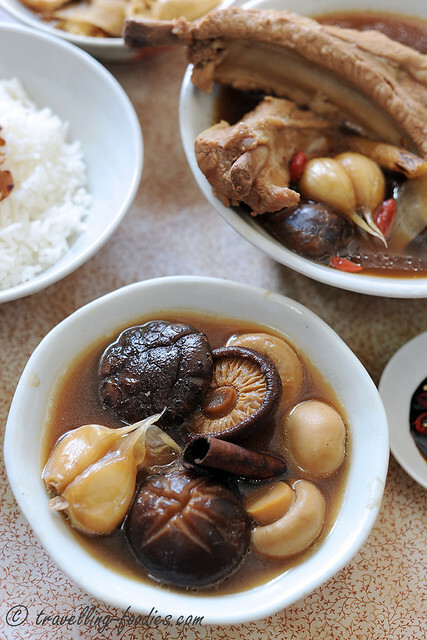 Chinese mushrooms with button mushrooms. I was told that initially, only Chinese (Shiitake) mushrooms were used. Button mushrooms came later, and so did enoki mushrooms. 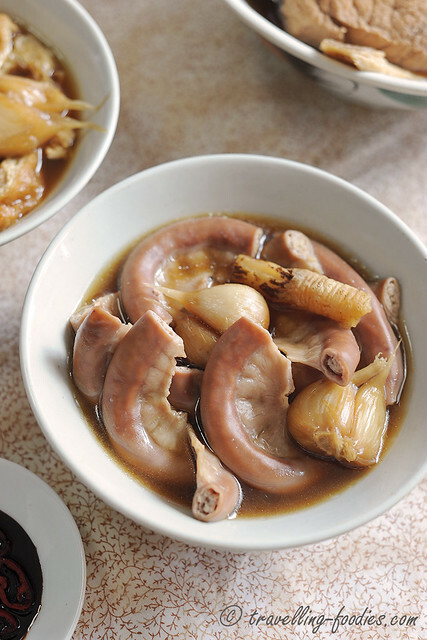 Sweet intestines are also commonly served as a side dish. Some shops also have similar versions using liver and kidney! 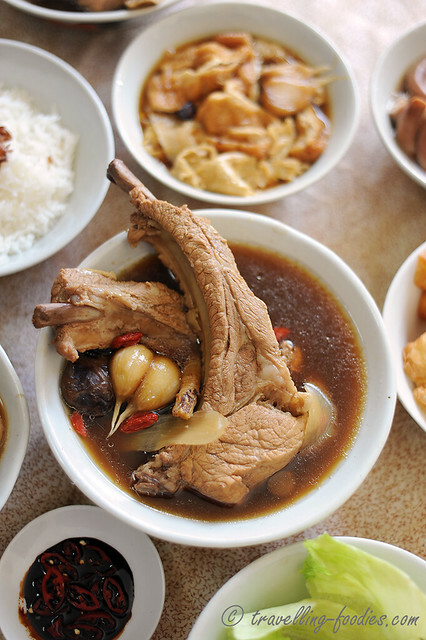 Tau pok (deep fried bean curd puffs) and tau kee (deep fried bean curd skin) are yet another two dishes found alongside a bowl of bak kut teh. These do not require prolonged cooking as they readily soak up the broth together with all the flavour within. 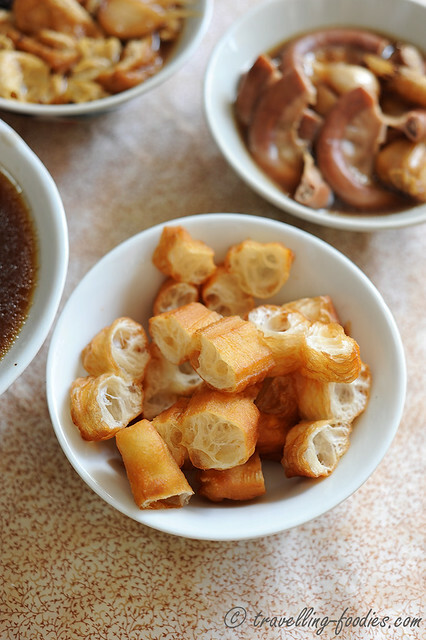 You tiao (Chinese dough fritters) is also a favorite amongst bak kut teh aficionados, using them to soak up the broth. 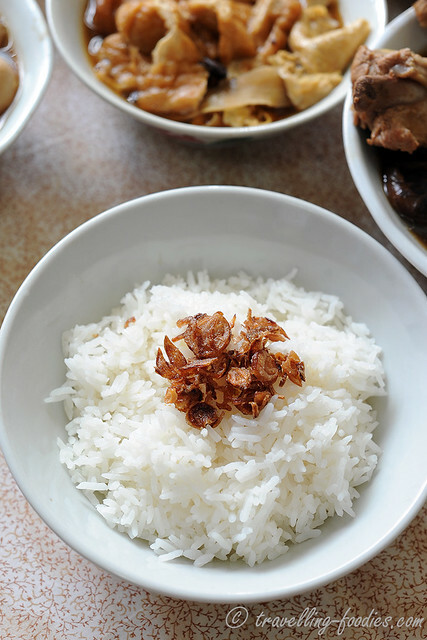 In Klang, many bak kut teh shops still carry on the tradition of serving rice mixed with lard oil or shallot oil. 6-8 canned button mushrooms 蘑菇, rinsed. Halve if the whole mushrooms are too big. 6-8 deep tau pok (fried beancurd puffs ) 豆薄/豆皮, rinsed and squeezed repeatedly to remove as much excess oil and water as possible. To a pot of boiling water add chopped big bones and blanch for 10-15 seconds until the exterior just turns pale. They may continue to ooze some blood but that is normal. Drain and set aside. Repeat the blanching process for prime ribs and finally sweet intestines. Discard blanching water. Rinse all the herbs and crush peppercorn. Place the herb and spice mixture into a muslin bag if using. To a large pot, add 6-8 bowls of water. Bring to a fast boil and add the herbs and spices except for wolfberries. As it come to a boil again and then lower to medium low flame and let it simmer for 10 mins with lid on. This is to allow the flavours of the herbs to infuse into the water. Add pork bones, pork ribs and garlic. Bring to a boil again before lower to medium low flame and continue to simmer with lid on for 30 min. Add more boiling water if necessary. Periodically use a ladle or small wired sieve/tea strainer to remove any scum or blood clots on the surface of the soup. This helps to keep the soup clear. After 30 min, add chinese mushroom, button mushrooms and sweet intestines. Season with salt, soya sauce. Adjust taste and colour with amount of dark soya sauce used. Let the pot simmer with lid on for another 20-30 min. During the last 10 min of cooking, ladle some soup into another small pot to cook beancurd skin and beancurd puff. Add wolfberries at this point. Check for the texture of the pork ribs. They are ready when the meat comes off the bone easily but does not disintegrate. Adjust taste with salt and/or soya sauce. Serve bak kut teh with chunks of you tiao, chopped chilli and dark soya sauce dip, and cooked rice tossed with scallion oil. 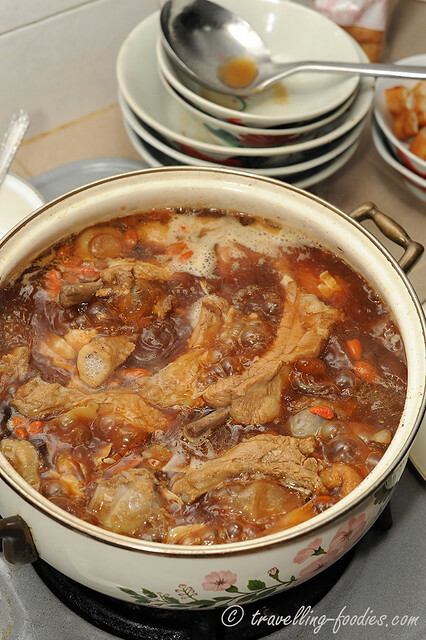 The actual cooking time depends on the size of the meat chunks as well as the part and portion of pork used. Some bigger cuts may require a longer cooking time and of course smaller chunks would require much less time. So please adjust accordingly by eye balling the texture of the meat during the simmering process. 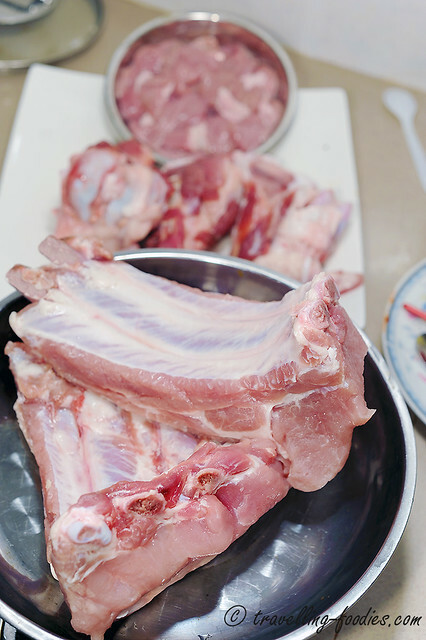 If a deeper shade of pork ribs is desired, soya sauce can be added together with the pork ribs initially. Wolfberries should not be added at the beginning with the other herbs and spices as prolonged cooking would cause the soup to turn sour. This entry was posted on July 11, 2013 by Alan (travellingfoodies). 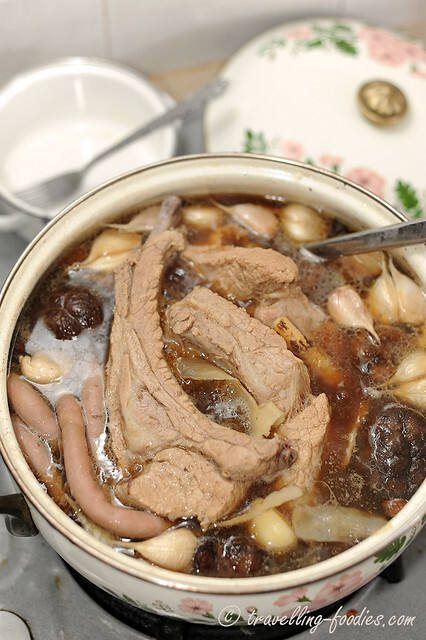 It was filed under Food, Simple Eats and was tagged with Bak Kut Teh, button mushrooms, chinese mushrooms, 玉竹, 福建肉骨茶, 粉肠, 肉骨茶, 肉桂, 胡椒, 腐竹, 蘑菇, 香菇, 黄芪, garlic, goji berries, herbs, hokkien, kelang, Klang, prime ribs, Selangor, small intestines, spare ribs, tau kee, tau pok， 枸杞, wolfberries, youtiao, 党参, 八角, 北芪, 大骨, 川芎, 巴生, 当归, 排骨, 枸杞子, 桂皮, 油条. cauliflower ? omg that’s such a no no … come down to Klang la!! i bring u on BKT tour lol!! I have not seen cauliflower being served with bkt in Klang, I think the folks would faint if they see that lol! Very kut lat preparing even the herbs from scratch! Has anybody tried out the recipe already? Is it close to Kang BKT? I can’t find anything in Singapore that taste just the same….. So no choice gotta learn how to cook by myself…. Yes, several of my friends have tried the recipe and one of them commented that it is very similar to the on by Fung Keow I’m Klang. Hi, thanks for this recipe. I love klang bkt. Am going to cook some using your recipe. Can I confirm if the 5 -8 white peppercorns refer to 5 to 8g or jus 5 to 8 units of peppercorns? What would you recommend to increase if I would like to increase the taste of the soup base? Also, whats the distinguished different by using the smoked garlic and normal garlic in the soup?